Located in Barry County Missouri, the Pineview (Tower) Trailhead is 5.5 miles west of Cape Fair on Highway 76 off Farm road 2150, and around 4.5 miles on Highway 76 from Highway 39. See Getting To Piney Creek below. The trails are rough and sometimes difficult to follow, there are lots of creek crossings, and the vegetation can encroach on the trail. Beware the poison ivy and we’ve encountered a Timber Rattlesnake sunning itself on the trail. It is also the only place where you can wild camp with a view of Table Rock Lake. There’s lots of elevation to give you a really good workout, and it’s nice and quiet. If you are wondering why we labeled this wilderness as a place to go paddling, we are planning a kayak camping trip. Putting in at Cape Fair, paddling the eight miles to Piney Creek and then camping and hiking. October 18, 2012 – Higher resolution maps uploaded. GPS KMZ file and PDF version added. 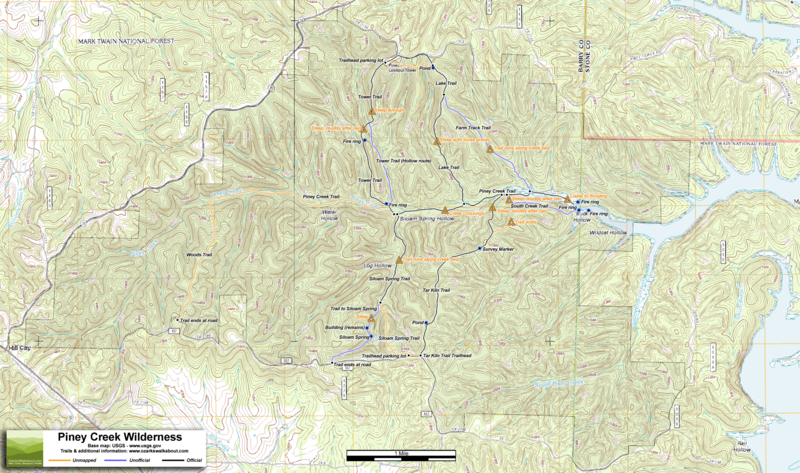 View a larger version of the Piney Creek Wilderness, MO trail map on Google maps. Click on the trails and markers to read further details. We also have this image file that you can print. Starting at the Tower (Pineview) trailhead there’s an easy descent along a ridge before the trail becomes very steep and rough going. The descent finishes at a small creek, after which there is a steep 80 ft. climb in soft ground. The trail then follows the contour with lots of seeps until it drops down a easy descent to Piney Creek, There’s a large fire ring to the east of the trail at the end of the descent just before you arrive at the Creek. Some very steep gravel covered sections are challenging to descend. Mapped by GPS: June 9, 2012. Eastern part from the Tower Trail to the Lakeside. The trail gets flooded during heavy rain, and has a lot of heavy vegetation. It’s quite easy to miss the trail in places, especially where there are creek crossings. Western part as yet unmapped by GPS. Track taken from USGS topo map. From the north it’s easy going until you start to climb up the ridge. Several creek crossings and the trail runs along the creek bed in places. Obviously it’s wet when the creek is running. Lower portion mapped June 7, 2012. Unmapped by GPS, traced from USGS Topo. There’s a primitive trail head with a fire ring near Farm Road 2185. The trail is fairly level along the ridge, with a few easy climbs before it starts to descend, ending with some very steep gradients and muddy conditions in the wet as you drop down to the creek. An old stock pond (with water June 2012) can be found to the West of the trail on the ridge. Note: As of June 2012, the official maps incorrectly mark the point where Tar Kiln Trail joins Piney Creek Trail. The trail Junction can be found immediately after crossing Piney Creek, about 300 yards to the west of the original junction shown on the maps. Mapped by GPS June 7 & 8, 2012. There are no official names for these trails, so we’ve made some up. The trails are not marked on the wilderness brochure, and are not shown on the topo maps. Obviously there is no trail maintenance, and the trails may move over time. Expect more hazards on these routes. This route veers off to the south of the Tower Trail by the creek at the end of the first descent from the Tower trailhead. It avoids a steep climb by going down the hollow. It’s an easy route, though much overgrown, with a couple of creek crossings. Linking the Piney Creek Trail to the top of the Lake Trail, this was obviously a farm track at some point. It is a much less demanding route out from Piney Creek than the Lake Trail, with only a couple of steep climbs. After crossing the lower part of a ridge the trail follows a hollow up to meet the Lake Trail. There are lots of fallen trees on this trail, and the trail runs along the creek bed in places. Look out for signs of the old farm track as you go. Mapped by GPS April 1, 2012. This is an alternative route to Table Rock Lake going south then east from the Piney Creek Trail. It avoids the rather claustrophobic, overgrown and very flat walk along the final bit of Piney Creek Trail. It also gets you to Buck Hollow avoiding crossing the lower parts of the creek / lake, useful when they are high. The trail is steep and soft going in places so it will probably be tough going in the wet. It brings you to Table Rock Lake at a fire ring and very Ozarks campsite – complete with metal chairs with bullet holes. Despite this it is well worth a visit. Length: .87 Miles (to the road) .4 Miles to Siloam spring. Elevation gain: 442 ft. (256 ft. to the spring). Surprisingly there is no ‘official’ trail to Siloam Spring. There are some steep gradients and the ground will get soft in wet weather. June 2012 – The spring box had water in it even though Piney Creek appeared to have been dry for some time. Look out for the remains of a small building by the trail a few hundred yards north of the spring. Going south past the spring the trail is easy to follow and climbs gently up a hollow. There’s a short steeper climb to get to the road. Google Street View of Farm Road 2150 from State Highway 76. Tower Road and the Pineview Lookout Tower trailhead is approximately .75 miles down Farm Road 2150. which is located approximately 5.5 miles west of Cape Fair on Highway 76, and around 4 miles east on Highway 76 from Highway 39. The Google car hasn’t gone down Farm Road 2150 so here’s a picture of the entrance to Tower Road, which leads to the trailhead. Check out our Terms and Conditions for using this site before you use our trail maps. I have been utilizing your Missouri wilderness pages for some research I am doing for a project and it has been immensely helpful! Thanks for your efforts. As a website owner, I know you are doing this as a labor of love and not as a big (if any) income source. I am leaving off my site name as to not appear to be spamming. 10/8/16 Hiked in on TarKin Trail, Looked for SiloamSpring Trail to come back out, but creek seemed to turn north instead of straight on west before we found it so ended up crosstrekking south up the slopes from about CreekCrossing or Lake Trail area, finally intersecting TarKin trail . Really enjoyed it, not an easy stroll, especially not the rocky creek bed. Dont think the BowHunters camped on the trail head appreciated us cuttin in, but they were cordial. Thanks for your website & all the usefull info making my trip a success. Sounds like you had a good time. That’s a busy point on the trail, There’s a creek running down from the north and the Tower trail, and then Siloam Spring coming in from the South and Piney creek coming in from the west all within a 50-100 yards and the underbrush can be quite dense. I agree, those creek beds are a hard slog, and the sides of the hollows are steep, it’s a good work-out! Wow what a great job you have done on this, best I have ever seen. Too bad the US Forest Service can’t seem to do anything close to this.